We’ve all seen professional, custom wood work and wished we could make something as beautiful ourselves. If you want to start working with wood, don’t be overwhelmed by all of the different tools and terminology of the trade. There are many different types of tools that you have to have on hand in order to complete a quality woodworking project. It can be difficult to keep all of the tools straight in your mind. What is a plunge router, and how is it different from a traditional router? 1 What is a traditional router, and what is it used for? 2 How do I use a traditional router? 3 What is a plunge router, and how is it different from a traditional router? 4 How do I use a plunge router? What is a traditional router, and what is it used for? A traditional router is a powered woodworking tool that is used to carve out wood in various designs to create a decorative edge. Routers are used to create the finished edge on cabinet doors, dining room tables, and wainscoting. 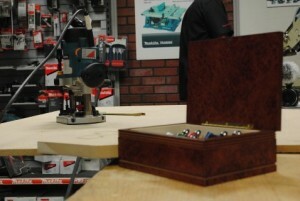 Router bits can be swapped out to make different styles of cuts. Popular edges include the ogee, roman ogee, chamfer, dado, and the dovetail. A router is a fundamental tool in almost all finished wood working projects. How do I use a traditional router? To use a traditional router, you power the router on and push the router bit along the edge of the piece of wood you’re working with. The router stays in a straight line because it follows the edge of the wood you selected, giving you a beautiful, straight, finished edge. What is a plunge router, and how is it different from a traditional router? A traditional router is a great tool in any wood worker’s tool box, but it is only good for adding decoration to the outside edge of a piece of wood. There is no way for the bit on a traditional router to carve out a decoration in the center of a piece of wood. This is where a plunge router comes in handy. With a plunge router, the bit is suspended above the surface of the wood, allowing you to position the router anywhere that you choose on the board. You then you push down on the plunge router, and the bit comes in contact with the wood and starts to carve out a decorative edge. To help determine which type of router best suits your needs checkout this page. How do I use a plunge router? Plunge routers are great for the finish work on the panels of cabinet doors, delicate inlay work, cutting mortises, and stopped dadoes, grooves and flutes, and so much more.